We started to receive some positive feedback on our "special" vitamin A & D ointment Infadolan. (Read about Infadolan's ingredients in our web store). I tried to find another one that mentioned how there was absolutely no irritation but instead a cool, soothing feeling, but I couldn't find it in my inbox any more. 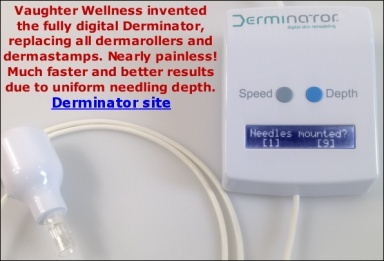 I received my Dermaroller in January and have used it once. I'm looking forward to seeing results, with continued use and time. I had to write to you today, to share a big *WOW* about something unexpected - the Infadolan cream. After just one use, I noticed that my undereye lines and creases were markedly improved. I'm in my early 40s with fair and very dry skin. I think my skin is in good condition overall. (Eye lines and crosshatched skin when smiling are the only trouble spots.) I've never found a product that works half as well as the Infadolan. Now I used it at night on a regular basis and each morning I awaken to smooth, youthful skin in the undereye area. Thank you so much for this unexpected discovery. PS - I'm very happy with the Dermaroller, too. You should benefit from the vit. A at the very least. Do you run into issues with greasiness? >It is greasy, but I don't use much and I only apply it at night, so it is not a problem. And when I weigh the greasiness against the positive effects, it is so worth using!! >like what I have experienced. >Thanks again from a very grateful customer. >I was very impressed with the infadolan ointment, and your sensible consiseration of an alchohol/irritant/paraben free ointment. >I previously had dermaroller treatment from a professional who gave me Chiroxy cream to apply afterwards. >This left my skin dry/irritated and peeling. The infadolan is soothing and I had no peeling at all after my second dermaroll. Just to add, I really am very impressed as well with the Infadolan. I kept things very slow in healing my scars post-needling, using Infadolan throughout with nothing else. It is amazing that it did nothing to irritate my skin, considering that I was just relieved of acne half a year ago. I've just used it since January, but if there are any changes, I will be sure to post! Hi Sarah, I just wanted to let you know that just over a week ago I had my face resurfaced by Fractional CO2 Laser. Basically the laser uses the same principle as needling but with added heat. After the procedure patients are asked to use vaseline or a similar product to ensure the skin stays very moist. Instead of Vaseline I used the Infadolan I got with my dermaroller kit and I healed beautifully. The ointment was very cooling and because of it's oily consistency it stopped my skin from feeling tight which is a common side effect of laser. So thanks I am very impressed with this product. I used infdolan after rolling my whole face and I absolutely loved it! It felt soo soothing to my skin and it didn't sting or anything. Also so far no breakouts at all even though I'm acne prone plus it made the redness after rolling subside really quick. Great stuff, thanks Sarah! after reading the testimonial about the eye wrinkles I decided to try it there too and um yeah I'm pretty shocked that my fine lines around my eyes are now nonexistent after only using it there twice.Wow after how much $ I've spent on eye creams to think lanolin would do the job. THANK YOU Sarah. Dear Sarah, thanks so much for your Infadolan! I received it a few weeks ago, and I will not leave home without using it on the backs of my hands. Such a HUGE difference! I noticed something today that made me laugh a little: I went to the grocery store, and the bag person handed me the first bag of groceries at the counter. When I reached for it with my left hand, I noticed that it looked years younger than it usually does! I found that so awesome that I reached for the second bag with my OTHER hand just to peek at it, and it too looked great! Goofy, I know, but I was excited! My hands actually looked older than my own 78 year old mother's, until now. Oh, and it does wonders for the neck, too. I have crepey skin on my neck even at 48 years old, because of deep sun worship until I was thirty. The infadolan wipes that out almost completely. I carry some in my purse for occasional re-application if needed during the day, which is usually not necessary. Thanks, again, Sarah! I really think you are the world's leading expert on microneedling, and related skin products. I mean that sincerely. No one knows or cares about micro-needling like you do. God bless you for sharing with us. Thank you very much for sharing your experience, and the compliments! I also use Infadolan on the back of my hands daily. It is too oily to apply it on the face daily but it is excellent for areas with dry skin, such as around the eyes, on the lips, the back of hands, on the neck, elbows, foot heals etc. Applying just a little is sufficient. Infadolan is an excellent moisturizer. It forms a film on the skin that prevents the evaporation of water and makes wrinkles less visible. The vitamins it contains may even have some permanent effect on the wrinkles if used long-term. It does not contain a sunscreen so apply it on top of your sunscreen lotion. I use the infadolan as a study showed that water evaporates from the skin more quickly immediately after dermarolling. I mix argan oil with it too before apgplying to the dermarolled skin. I'm scared though that the wax from the infadolan as well as the good stuff will sink in, as the skin is open straight after dermarolling isn't it?. Do you have any input? Thanks. Even though I'm somewhat new to all this, I just wanted to chime in and say Infadolan is some great stuff! I purchased a couple of tubes with my first order to apply to rolled and stamped areas, and while it took me almost a couple of weeks to work up the nerve to start actually rolling and stamping (turns out it's not so bad, really!) , I immediately started using the Infadolan around the eye area based on some of the posts and threads I'd read here. Prior to that, I'd been using a 0.04% time release tretinoin (retin-a micro) in that area in conjunction with obagi elastiderm for about 3 months and had already achieved significant results in reduction (about 50%) of mild crepiness in upper eyelid and a little just below the eye. However, adding the Infadolan (I apply at night before retiring) took away at least 30% more of it and just in a week or so. My eyelids haven't looked this good in at least ten years. One thing I should have probably mentioned in the previous post is that while the elastiderm eye cream has given me good results, it is some major $$$; can run up to $100 US - and took more time for me to get noticeable results from it than from what I've seen in a rather short time from the Infadolan. The jar of eye cream lasts about 3-4 months, maybe 5-6 tops if you moisten the area prior to application and apply rather sparingly. In contrast, the Infadolan is only $9 a tube and a little goes a very long way. I suspect one tube would easily last more than a year, if only applied to the eye area. I'll finish up the elastiderm of course, but will probably just use the Infadolan when I run out. I really appreciate you took time and posted your experience! I have been using this under my eyes for a year & it is great!! I feel like I know a secret or something. I can't be without it. I am 40 & have fair skin. Thank you skinfan and welcome to our Infadolan fan club!